Say goodbye to language hassles and hello to two of southern China’s most beautiful ancient water towns on this door-to-door private full-day trip from Shanghai. 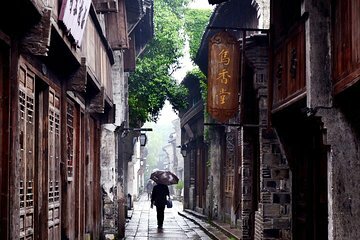 Spend the day in 1,300-year-old Wuzhen: stroll cobbled paths and ancient bridges, enjoy a leisurely cruise, and feast on a local lunch. Then transfer to historic Xitang for a spectacular sunset, a riverside dinner, and a walk through timeless streets by moonlight. 5 Stars for the day trip with Berlin. Enjoyed Xitang best because of atmosphere; food samples and looking at different trades made the day special. Berlin was an excellent guide, translator and negotiator! The tours through Wuzhen and Xitang were amazing. These places are definitely off the beaten path of most western tourists, and both places have a very authentic, local vibe. Our guide was helpful and informative, and she really helped quite a bit with bargaining with the local shop keepers for some fantastic discounts! I would highly recommend both this tour and especially our guide, Xin. Our group of 10 really enjoyed the tour. Berlin was very attentive to our needs and preferences. She also gave us a very informative tour especially when we were in Wuzhen water town. The food was delicious and filling. We had a fun day tour. I give 5 stars to our guide Alana. She has been the greatest tour guide I have ever had she is so professional. She gave us the time and the information about all of the stop we did on this tour. I would like to thank her for been such a nice person she tread us great through the excursion. Alana, you did a great job to make our day unforgettable. Thank you again.